Heat gas or charcoal grill. In 1-quart saucepan, heat barbecue sauce, rum and honey to boiling. Cook 2 minutes or until reduced to 1/2 cup. Reserve 1/4 cup sauce for serving. Use remaining 1/4 cup sauce for basting. Carefully brush oil on grill rack. Place pork on grill over medium heat. Cover grill; cook 8 minutes. Turn pork and baste with 2 tablespoons of the sauce; cook 8 minutes. Turn and baste with remaining 2 tablespoons sauce. Cook 4 minutes longer or until meat thermometer inserted into center reads 145°F. Let stand 3 minutes. Meanwhile, place buns, cut sides down, on grill for 1 to 2 minutes or until toasted. 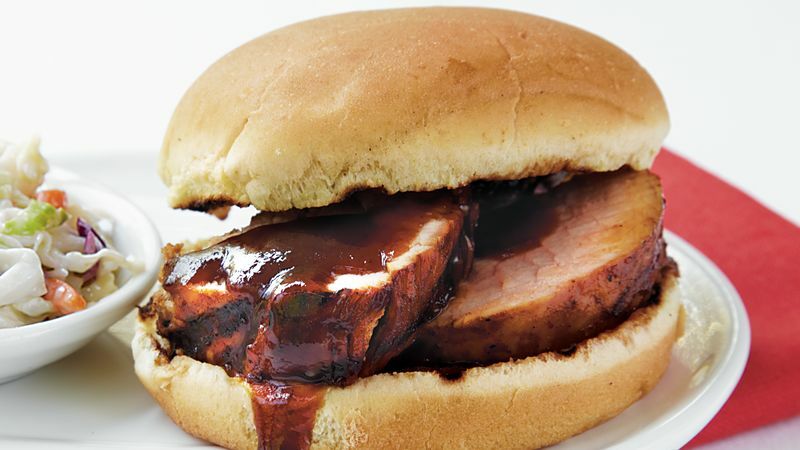 Cut pork into thin slices; evenly divide among bun bottoms. Top each sandwich with 1 tablespoon reserved sauce. Cover with bun tops.